Leah Hogsten | The Salt Lake Tribune l-r Sen. Jim Dabakis, D-Salt Lake City, and House Speaker Greg Hughes held a news conference Tuesday, June 5, 2018, to detail a "compromise framework" for the new inland port authority. In March, lawmakers approved SB234 to create an international port on thousands of acres in the northwest portion of Salt Lake City. In addition to building the shipping port on about a quarter of city land, the bill made the port's board the final appeal panel for disputes over land use decisions, and it allows the port to take over all tax-and-spend power in that area. A pair of prominent state lawmakers, both on their way out of office, unveiled their plan to address Salt Lake City’s concerns with a proposed shipping port that would send and receive massive amounts of goods by rail, road and air. And, despite criticism about the unorthodox behind-the-scene talks, it appears that Sen. Jim Dabakis, D-Salt Lake City, and House Speaker Greg Hughes, R-Draper, developed a plan that could gain city approval. The changes would address concerns about the environmental impacts of the shipping facility the state plans to develop west of the airport on about one-third of Salt Lake City’s total land. They’d also ensure the city keeps ownership of its airport, deal with tax-and-spend authority and address other issues raised by city officials who fought the details in a last-minute bill passed by the Legislature earlier this year. The focus will shift now to see whether the two lawmakers, who are polar political opposites, can sell their ideas to the City Council, Mayor Jackie Biskupski, Gov. Gary Herbert and state lawmakers, who would have to pass a compromise bill if the governor calls them into special session. 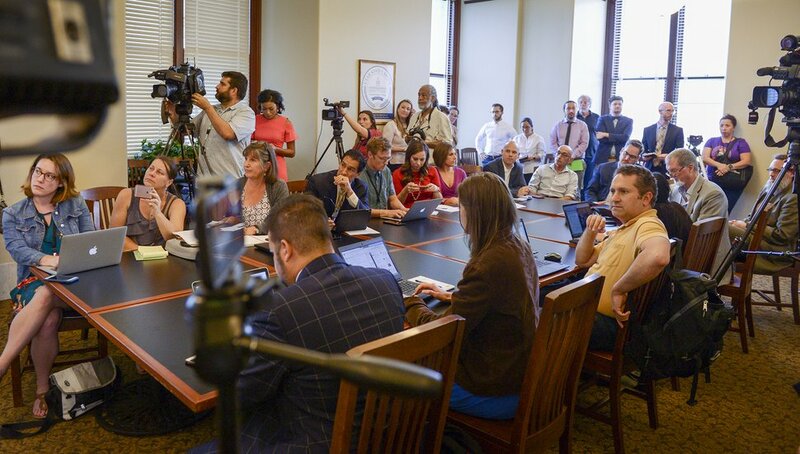 A collection of City Council members, reporters, lobbyists and community activists all assembled at the state Capitol to hear what Dabakis and Hughes came up with in a round of quiet negotiations first reported by The Salt Lake Tribune on Tuesday. Dabakis and Hughes said they found agreement on the tax-and-spend power that the inland port authority will take as the roads and rails are developed and goods are shipped into and out of the city’s airport. Instead of taking all the money, the port authority would control perhaps 75 percent of it, with other local entities included in the boundaries taking the remaining 25 percent, Hughes said. The two also said they worked out a compromise on the way land use appeals would be considered. City officials worried grievances would be left up to the port authority board, which by state law must focus primarily on economic development. Under the compromise, the city would have six months to fix land use disputes on their own before they go to the board. The vocal and consistently liberal Dabakis, who voted against the bill that created the port authority, said he joined Hughes, the lawmaker who led the creation of it in negotiating some changes because it was the best way to get concessions on a project that is clearly moving forward. The details, which caught even Democratic legislators who represent the area by surprise, marked what Hughes and Dabakis said was the beginning of the process to get city buy-in. Despite the surprise nature of the discussions — City Council members were brought in shortly before the news conference — members of the council and the Biskupski administration indicated early support of the concepts. Leah Hogsten | The Salt Lake Tribune Sen. Jim Dabakis, D-Salt Lake City, and House Speaker Greg Hughes held a news conference Tuesday, June 5, 2018, to detail a “compromise framework” for the new inland port authority. In March, lawmakers approved SB234 to create an international port on thousands of acres in the northwest portion of Salt Lake City. In addition to building the shipping port on about a quarter of city land, the bill made the port’s board the final appeal panel for disputes over land use decisions, and it allows the port to take over all tax-and-spend power in that area. The groups have been fighting over the details in SB234, which created an international shipping port near the Great Salt Lake that supporters believe will connect Utah — and possibly its coal and oil industries — to international markets. The city had worked with lawmakers on details before the bill passed the Senate in March. When it reached the House, lawmakers pushed through their own version that included vast changes on tax issues and expanded the boundaries. The House passed its version shortly after it was released late on the 44th day of the 45-day legislative session, and the Senate agreed within a half-hour. The city has been fighting for changes ever since. The governor and other lawmakers have been interested in finding common ground, but it’s been hard to come by. The city thought it had reached an agreement with lawmakers and Gov. Gary Herbert in May, after the groups spent months working together on a compromise to be voted on in a special session of the Legislature. But when Herbert sent Biskupski a draft, the mayor told him it didn’t reflect the agreement they reached. That’s why Litvack was guarded Tuesday. “I personally may say that conceptually things sound OK, but until we see what that looks like in the legislation, until we see how that changes the current status quo in the statute, then we will know whether the issues that we are concerned about are addressed,” Litvack said. Under the newest concepts, money that’s created through the port’s development and operations would, in part, fund affordable housing, the two said. Wetlands along the Great Salt Lake would be removed from the port’s boundaries. Dabakis said the concept also included requiring any coal that’s shipped through or stored at the port to be covered, a requirement that’s not the current practice throughout Utah, Hughes noted. Not everyone is persuaded the region and surrounding residents will get a good deal, however. Despite the possible concessions on environmental concerns, Deeda Seed, who works for the environmental group Center for Biological Diversity, said the port’s development would bring in trucks and trains that would make the valley’s air quality — already out of compliance with federal standards — even worse. House Democrats released a statement critical of the way the negotiations were conducted — without any involvement by them or the city. They said they were “blindsided” and “shut out” of talks and slapped at Dabakis as “hypocritical” for always complaining about backroom deals and then engaging in them for the inland port. 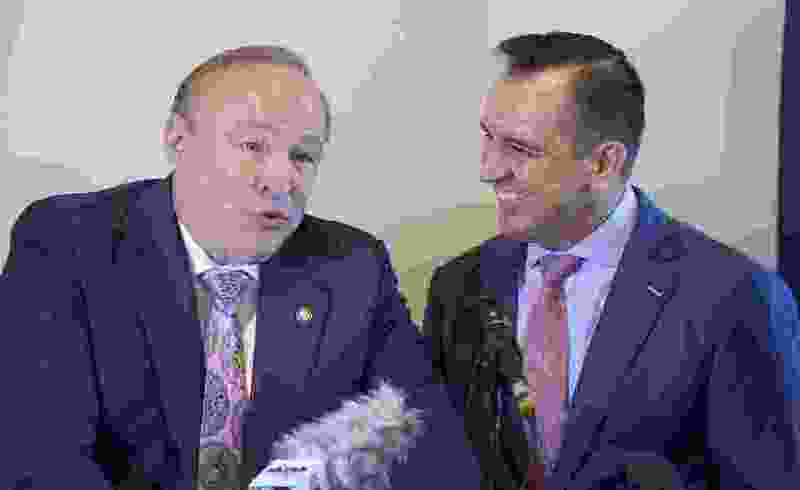 Talking to reporters, Dabakis, who is exploring a potential run for Salt Lake City mayor, apologized for not including the local representatives and senator in the talks, but he said now was the time for them to bring out their ideas, which he and Hughes, a potential 2020 gubernatorial candidate, said marked a process of negotiating and finding compromise, not a final deal. City Council Chairwoman Erin Mendenhall said the details given just before the news conference to members of the council — most of whom then attended the conference — were ones the council could possibly get behind.